We hope you are inspired to want to take part or volunteer or help us in our work and help to ‘Catch a Few More Smiles’. The charity is an entirely voluntary organisation and a Masonic ‘not for profit’ venture. It relies heavily on the goodwill and time of its volunteers and helpers to organise events for disabled and disadvantaged people up and down the country. Branches of MTSFC are organised on a County or Province basis and in the Areas and Events section you can see the current branches and where events are held at the moment. You do not have to be a Freemason to join in the fun! So please click here to volunteer with us. The following video will show you what is required of our volunteers at the events. If you would like to make a donation to our charity please click here for more information. We always welcome new participants and if you want to know more about how our days are organised go to the ‘The Charity’ tab which you can do by clicking here. Most of our participants are drawn from Special Educational Needs Schools, or units and adult centres. We also invite individuals to events who can bring their own carers. The charity does not provide transport to and from the event and this must be organised by the organisation involved. Participants must be over eleven years old and sufficient carers, teachers or helpers must accompany the group to cater for their personal needs. Likewise any special dietary needs would need to be brought with them for the day although the charity does provide a barbecue lunch with a vegetarian option and tea, coffee, soft drinks and water throughout the day. Please go the Area & Events section for more information about events in your area and the person to contact. You can go there by clicking here. They will give you more information and be able to give you Risk Assessments, a copy of our Insurance Certificate and Health & Safety information for your trip. If you cannot find an event in your area please email us by clicking here. You must be prepared to fill in and submit a Disclosure form to the Disclosure and Barring Service (DBS) for the safe working with children and vulnerable people. This is completely free and totally confidential. On completion of your DBS Disclosure you will be sent some more information about the charity and the Health & Safety issues. On arrival at the fishery a ‘Safety Rules’ and general briefing will take place before the participants arrive. 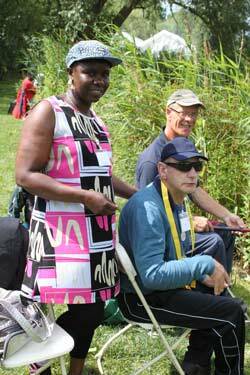 When the participants arrive with their carers you would be introduced to one and asked to take them to the lake to fish. Subject to their ability, you can then show and let them bait up, cast, retrieve, hook and land the fish. It is not for you to show them what you can do but to see what they can achieve. There would be a break for lunch would be provided for you and all the participants. Just before the participants leave a presentation is made for biggest fish, best caster, and best retriever. In the case of coarse fishing it would be most fish, biggest fish and best caster. So you will have an important part to play in their enjoyment and success on the day. But the days are not competitions and all participants receive a certificate of competence. You would be expected to provide your own tackle for the participant to use and the charity will not be responsible for any breakages that may occur, so it is best to bring your old gear. As the teachers, carers or helpers come with the participants you will not be dealing with any personal needs of your charge. Details of this will be given to you on the day. You must have a valid Environment Agency Rod Licence. There is absolutely no charge to you for attending although a raffle is often held which you may like to lake part in. You do not need to be a Freemason to help us. 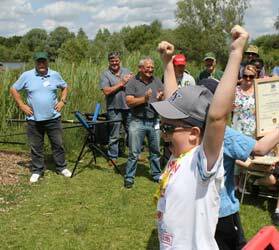 Helpers are always welcome as well and would be involved in preparing the barbecue and lunch, taking drinks around the lake, setting up, clearing away, helping the casters with their charges or generally helping to make sure that our participants are having a good time. Helpers are also subject to a DBS Disclosure clearance as above. Organisation is the key point of our activities and all the events rely heavily on a number of people to help organise them. Some of the roles include, Event Organiser, Schools Liaison Officer, Caster Registration Officer, Catering, Photography, Publicity and PR and general help on the day. If you would like to help our growing band of organisers it is not vital that you are a Freemason so please contact us by clicking here. We are organised on a County or Provincial basis and every area needs a small organising committee to get it going. It is not a particularly difficult or onerous job to start off with and a small event in your area would be relatively easy to achieve. Maybe you already know of a school that may like to participate, a fishery that would welcome you along or a bunch of fishermen keen to participate. Either way it will give enormous satisfaction and enjoyment to both the participants and you as well. The main organiser or Chairman and the Treasurer of any local committee must be a Freemason and all members of the committee will need to be DBS checked before you can commence. You will also need your Provincial Grand Master's approval before any action is taken. Before you embark on this course we would like to talk to you to explain things more fully and to send you some more information. In the first instance please email us by clicking here .